Add commands to your sudoers file with syntax checking. 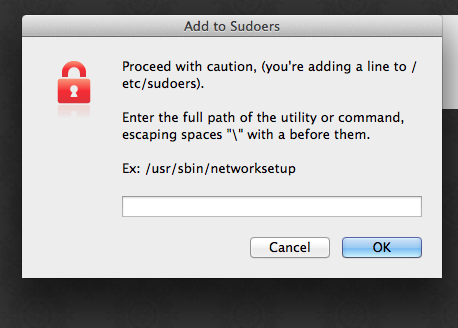 Add lines to your sudoers file from Alfred2. You input the line through an AppleScript dialog. Just invoke it with "addsudo"
It adds the command for only the user who invokes it. The workflow runs the new version through visudo to double-check your syntax, so this won't destroy your sudoers file. You need administrator access to use this workflow. Bonus: Also included is "which" so that you can find out where the file you need to add is. Invoke it with "which <command>", and the path will automatically be added to your clipboard. It seems that Mavericks locked a bunch of things down, so this helps.